I often receive letters from women explaining that they feel guilty about their interest in perfume, because it’s “too indulgent” or “unnecessary.” It’s a luxury and we can live without it. Or so the argument goes. Except that it doesn’t make sense. Perfume is not a fundamental need for human life, but you could say the same for music, art, fashion, sports, restaurants or millions of other things that are not strictly necessary for survival but essential for a happy life. There is no reason to deprive yourself of something that gives you pleasure, and giving in to it shouldn’t be associated with guilt. Scent is one of the simplest and most rewarding of enjoyments. By stimulating the sense of smell, you fantasize about another time and place, uncover a whole universe of new sensations and add splashes of color to the most ordinary day. Something as ubiquitous as a trip to the grocery store can become a fun experience as you smell the earthy tang of carrots or the pungent sharpness of onions piled in the vegetable section. New research has revealed that the sense of smell is even more intricate than previously thought, and that smelling is one of the best exercises for the brain. But like many other “feminine” pursuits, a perfume hobby can be harder to defend, because it’s viewed as frivolous and expendable. You rarely see indignant comments on the sports pages or the photography forums that the money spent on prime tickets or fancy lenses could be better spent if donated to charity. On the other hand, they crop up time and again in the beauty sections of newspapers and blogs. The same people who admire my husband’s collection of wine bottles look perplexed when entering my office with its rows of perfumes. Unlike makeup or fashion, perfume is still a relatively niche hobby and many perfume lovers find themselves guilty and alone in their love for scented things. Guilty pleasure, however, is not much of a joy, and I refuse to let guilt taint my enjoyments. Carving out time for ourselves is essential for maintaining balance in our busy, stressful lives, and I can’t count the number of times when a waft of my perfume brightened up my day and made me smile when nothing else did. I also want to reinforce the argument I often make on these pages–perfume is not a hobby reserved for those with unlimited personal wealth. Mine started when I was living on a meager student stipend. Unlike many other hobbies, perfume can be easily tailored to the individual budget, without compromising in quality (see many ideas in How to Make Perfume Hobby Affordable). It goes without saying that we’re our own finance managers and know how to build a reasonable budget that accommodates all of the necessary expenses, but the bottom line is that there is nothing wrong with spending money on our favorite pursuits. On my last visit to Ukraine, I was browsing at the tiny village museum devoted to the Second World War and the local heroes. In a display case featuring the favorite things of a young resistance fighter, there were two objects that I couldn’t miss. One was a powder box and another was a perfume bottle. 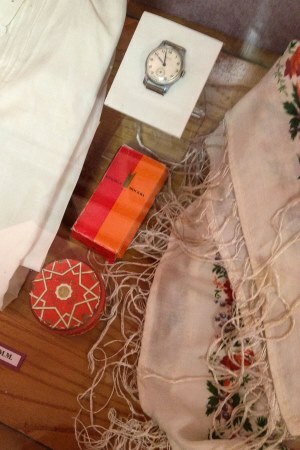 I immediately recognized the crimson-orange packaging of Krasnaya Moskva, the most widely available fragrance in the Soviet Union, because I also saw it on my great-grandmother’s dressing table, sharing space with her beloved White Lilac and Bulgarian rose oil. She recalled that during the war a small bottle of perfume was always in her handbag, along with a tube of red lipstick. Her husband was fighting on the front lines, while she remained behind with two small children. In photographs from the period, she barely smiles, but her lips are enhanced carefully with color, and I imagine that her lace collar is redolent of the powdery lilacs. On the bleakest days, her lipstick and perfume were a reminder of beauty, happy days, and peace. Simple pleasures are not indulgences, they are necessities. SophieC: V – what a wonderful post. The right perfumes are aural poetry – and surely elevate the mind whether they are luxuries or not. Victoria: I completely agree! Scent and fragrance is very much about the experience, and I like that the enjoyment of perfume is something very intimate and personal, much more than of some other adornments. Cornelia Blimber: Indignant comments? i never saw such a thing, will pay attention. And i never had such comments myself. (maybe behind my back). Anyway, you are absolutely right. We all smell, consciously or not, and smells have impact, even on those who don’t realize that. As for perfume, I could not live without it. Funny: the wine of your husband and your perfume! There was a time when perfume was for men (included stuff like tuberose), and forbidden for decent women. I wonder if perfume was condemned then as guilty luxury? Victoria: Just go over to the beauty section at the Guardian, New York Times or some other newspapers and their associated blogs. I no longer read the comment section, because invariably there will be some people passing judgement and telling others what they should and should not do. And nothing makes me more ill-humored. The thing is that perfume as luxury for those with large income is very much a modern European concept. Take India, for example, where the daily worship (Hindu or Muslim) has traditionally included some sort of perfume. Or incense in Japan, which was used by absolutely everyone, from the very rich to the poor. Nikki: There will always be people who are miserable and who try to poo-poo beauty and dignity and ethics and everything that makes life wonderful and to which one should inspire to….it is the eternal fight between good and evil, between light and dark. Fragrance is an old and feminine art and it makes life fragrantly beautiful, dreaming a better life. One could conjure up lots of reasons why there is such hatred towards fragrant beauty in a bottle, from bare bones and simple Calvinism to the Madonna/Whore complex many men feel towards women. Cornelia Blimber: What a coïncidence! I was wearing Trésor and Colonia Intense together. Cornelia Blimber: Exactly. And a modest touch of soft leather in both, they reinforce each other. Tresor Edp. Illdone: There a saying, I don’t remember by who, that says you ‘re not dead or really gone as long as someone remembers you or thinks of you in a loving way. So it’s wonderfull to stay on someones mind long after you’re deceased. Family is so important and has such impact on people’s lives. Michaela: Oh, I would have said the same myself if I knew how to put it into words 🙂 Wonderful post, indeed! You are so right comparing sports and photography comments, vs. perfume comments. Totally agree. I am amused how a wine collection is broadly perceived as distinguished while a perfume collection as an obsession or snobbery. The hobby can be made affordable (thank you for your other posts as well, for example the one about the price of perfumes and how to recognize quality). And it’s not mandatory to be a hobby, it’s enough if you feel the pleasure of smelling beautiful scents all over, then why on earth not?! I see very well you never plead for excessive buying, but for discovering, understanding and enjoying scents. rosemary: oh, I love your comment! rainboweyes: Isn’t there a statistically proven correlation of rising sales figures for lipstick in turbulent times? Kate: Such a thought-provoking and moving post. And you are right – life is grim enough without po-faced puritanism; we really are entitled to cut ourselves a little slack sometimes! I agree about the affordability of perfume as a hobby – ok it’s not always cheap, but samples are available for much less, and all hobbies involve a little investment. I feel that the pleasure I get from perfume is out of all proportion to the small (ish) amount I spend on it. And there is always swapping! I can think of many more expensive hobbies. Victoria: Those arguments are simply judgmental and don’t make sense at all. Sure, you can even watch a play on TV at home for free. Or you can drink water from the tap for free instead of champagne. Saves money, right? But in the end, what’s the purpose of earning money if not to set some aside for enjoying life, and different people have different ways of doing so. I am one of those people that looks at my small collection and feels guilty sometimes that I have several bottle of my guilty pleasure. I also get confused on what do do with bottles that I received as gifts and do not use them. I do believe that perfume is a pleasure and Madam Chanel did say “I woman who doesn’t wear perdume has no future” or something to that regard. annemariec: You are right about splurges filling a void. My spending is much more under control than it used to be but I am still prone to the odd splurge. I belong to a perfume group on Facebook and this topic came up for discussion earlier this year. A couple of people admitted that they struggle with serious shopping addiction and left the group, ultimately, to avoid the constant posts about shopping and discounts and enabling and so on. Jillie: What a great defence of perfume-loving, V. I do sometimes feel guilty, but I don’t really have any other “vices”, unless you count my tea habit, so my perfume obsession is not too awful. A perfumer once told me that I might have been possessed by gambling or love of shoes, but fragrance is (mostly) not so costly and gives other people pleasure too. Unlike smoking, it’s not unhealthy. Zazie: Love this article! That picture with the tiny perfume bottle and powder box is so touching – it tells so many stories despite its deceptive simplicity. I agree with all your points, and yet I must confess that on the odd day, when I look at my 30+ bottles (or better say 40+?) I feel a spike of pain. It’s a lot of money, lined up there (a lot of pleasure too – but also quite a few mistakes), a lot of time spent reading and searching and testing… I do occasionally feel guilty for it all. I usually decide not to add any more bottles. To give away the mistakes. Then I think at those moments in life when the reassuring smell of my SOTD was there to comfort me. Zazie: @Solanace, @Liz K: LOL!!!!!!! Danaki: Yes. You should read the ‘hate’ that, for example, beauty coloumnists like Sali Hughes get on The Guardian (if you read it in the UK) website simply because the pursual of beauty is silly and frivolous and goes against feminist values, bla bla…Yet nobody questions as Victoria rightly noted men’s expensive (and frivolous) pleasures. Hannah: Maybe there isn’t solidarity because ugly women are always thrown under the bus. My huge nose and the gap in my teeth didn’t appear because I don’t take time to commune with myself or because I don’t take care of myself. carole macleod: I love the Sali Hughes column! And you are totally right about the comments…some are so full of hate it’s hard to believe. She did a really touching story around Christmas two years ago-she was recently separated, and was trying to make things cheerfull for her family, and her self-the comments sections had to be closed. i often feel guilty about perfume. I consider it necessary but in NS, and the Maritimes in general, scent is really frowned upon. You can smell as bad as you want, or radiate laundry muscs, but Nuits Etoilee is verbotten 🙂 i think perfume gives joy to the wearer, and the people around them. The Perfumed Veil: I hope this article is published in more places than one. It is just perfect! I love the nostalgia and refusal to bend to popular opinion. I believe it was you who paraphrased a Persian poet earlier this year: “if you have nothing but two dollars, spend one on bread for the belly and the other on a flower for the soul.” If I could reblog this article, I would do so (if I knew how). Anne of Green Gables: Like the others, I loved this article! Can’t agree more about a waft of perfume getting me through a difficult day. In the place where I work, people rarely care about fashion, makeup or perfume so I feel rather out of place time to time. Once, I was criticized by a colleague for reading fashion magazines which she thinks are useless. I don’t feel guilty for my hobby as I have a strictly set budget for it and also, I don’t limit the olfactory pleasure to perfumes. But there are times I question myself if I want a bottle of perfume for the sake of possesing it or if I really want to and will regularly wear it myself. I want to feel free and don’t want to be obssesed with ‘owning’ perfumes. Now, onto liking simple things. I can’t emphasize enough how much I disagree with the whole idea that what kind of scents you like reflect your taste level. I see these comments time to time here, and I always say the same thing. Our scent preferences are very subjective and are formed through such a complex prism of memories and individual traits that it’s impossible to generalize. If one person likes Chanel Cuir de Russie and another Aquolina Pink Sugar, it simply means that one likes leathery smells and another sweet ones. It doesn’t mean anything else besides that. Victoria: One thing I feel guilty about is taking time off to read for pleasure and do something that doesn’t involve writing, research or work. When you don’t have a 9 to 5 job and actually love what you do, it’s easy for work to fill in every gap. “Oh, but I could be doing something productive now!” is that feeling. On the other hand, I remember that some of my most productive and inspired periods happen when I take breaks, and I’m working to getting rid of that guilt too. Balance is key in everything. This is barely related, but your usefulness comment really made me think of it. Julie S: I agree wholeheartedly with the article and refuse to feel guilty about pampering myself. Liz K: Any time I start to feel guilty about my collection, some of which are very rarely used, I think of my mother who has been mostly anosmic since her 30’s and the joy she feels when she has a good day and gets a whiff of food or can smell a flower. There is no knowing if I may someday be exposed to a chemical, as she was, or have an illness that will dull, change, or eradicate my sense of smell so I will continue to enjoy perfume while I can. iodine: My psychoanalyst was anosmic after nose surgery, but he kept putting heavily scented flowers-lilies!- in his office, for his patients’ joy..
solanace: Thank you for saying this so eloquently, Victoria! Art is useless, but without it we would be facing the abyss alone. These little things unite us, and make life not only bearable, but even wonderful. These little things make ground for peace. It is nothing short of beautiful to see a bunch of people from all over the world talking about the smell of bread dough, or the latest Lutens. Of course, we might be considered frivolous in our work places, by puritan women who dress up as feminists or by self obsessed men who think everything a woman does is meant to seduce them. But from our vantage point, we know there is no people as witty, interesting, generous and overall amazing as perfume people. Which is not surprising, given the feminine and abstract nature of the subject. Cornelia Blimber: Hi Solanace! I know what you mean. In my time, some people did not believe that I was a student; make up, red lipstick, perfume were most unusual at the time, and certainly in the greek/latin department. I must say, i didn’t care about that. I think nowadays it has changed, there are some beautiful feminine classicists around. Mostly Italian, i have to admit. Cornelia Blimber: Oh, I am sure they are jealous. Women want to be pretty, scientist or not. Maybe some deny that (too lazy? low selfestime? fear of comments?) but seeing a woman who cares about her beauty, their womanly instincts awake. And then there are sour comments. Cornelia Blimber: I read Victoria’s comment after submitting my own. Well, she may be right. In that case: poor women, they don’t know what they are missing. But I keep thinking there is a kind of jealousy involved. Why sould they make comments when they simply think you are wasting your time? Patricia: What a beautiful article! Like Anne of Green Gables I budget for my perfume purchases and don’t feel guilty about them, but also like her I often feel guilty for liking something simple or conventional. I’m working on that one. Austenfan: Lovely, lovely post and so true! Few of my friends appreciate the art of perfume. And regard my collection with surprise and dismay. They don’t know what they are missing! Victoria: They really don’t! And when you like scents, you start enjoying other things more–food or drink, for instance. It’s a fantastic pursuit all around. Austenfan: I went to Nong Cha on a whim several weeks ago. Spent way too much of course, but it will all be enjoyed, in the end. I got one of those stunning green teas with those huge pressed leaves ( Tai Ping Hou Kui). Haven’t even started drinking it yet as I want to get a gai wan to properly make this tea. It is in the fridge still in it’s bag. Victoria: I got that tea too, and you’re right to store it in the fridge. I didn’t it, and it lost its flavor within a couple of weeks. It’s really quite delicate. Dries van Noten, liked it, unusual but not an instant hit. L’Eau de Magnolia: What a great spring or summer scent, airy, weightless, but somehow not without substance. Lys Méditerranée: Loved it, and I am not a huge lily fan. Géranium Pour Monsieur: Interesting, not on myself but would love to smell it on someone else. Une Fleur de Cassie: this was a retry. Wow. My favourite of the ones I tried. Dans tes Bras: Don’t know, it is interesting in an odd way. Ambre Précieux, which I know and love and their new Ambre Doré. It seemed more of a leather than an amber. Tom Ford’s Shanghai Lily: Very, very pretty, but I don’t “need” it. And I got a white Ceylon tea which I couldn’t smell properly as my nose had decided to block up. I must be allergic to some of the tree pollen that is around right now. iodine: Quoting Luca Turin: perfume is about beauty and intelligence- and how we need them both in our daily life! Smelling- not only bottled perfumes but, as you say, everything that comes to my nostrils, from linden blossoms in a park to sweaty bodies in an underground carriage- thinking about what I’ve smelt, making comparisons, talking about it… are among my greatest pleasures in life. Victoria: When you think about it, talk about, you also develop a new vocabulary, and it does so much to improve the day-to-day life. Today, I’ve smelled lots of lindens and also the wet clay from the construction site nearby. Ordinarily, I would have moved past trying to avoid the mess, but the scent was so evocative, spring-like really, and the combination of clay and lindens really was amazing. Annette Reynolds: Such a wonderful post, Victoria. It obviously spoke deeply to a lot of people, myself included. I’ve only started really indulging my love of fragrance recently, mainly because I now feel I have the extra money it takes to do that. But – like you – in my younger days I was still able to find what I loved and buy some form of it to have it near. And since I’m terribly sentimental, I’ve kept most of those small indulgences and so just the mere sight of them still gives me enormous pleasure – even after 40 some years. I also keep my mother’s and grandmother’s fragrances (and their whimsies) very close by. Your great-grandmother’s photo took me by surprise mainly because she reminds me so much of my grandmother (who was Russian). What a strong, lovely woman she appears to have been! And my grandmother, like your great-grandmother, loved her garden – especially her roses. Victoria: How lucky you’re to have your mother’s and grandmother’s fragrances! I really wish I still had a little bottle of my great-grandmother’s White Lilac perfume, because I can recall the scent perfectly, more so than the look of the bottle. But I have her photographs, letters, and some shirts and towels she embroidered. MontrealGirl: Annette, Would you consider including a photo of your mother and/or grandmother? I think it is lovely to have the image of the women next to the perfumes they wore because it makes it personal. (Victoria – your Grandmother looks simply elegant and it is a lovely photo with lovely memories to match it) I always thought it would be a great project to take photos of women (and men) with their favourite perfume bottle(s). It’s a way that each and every one gets to express a bit of our personality. Annette Reynolds: Aren’t these the sweetest memories, MontrealGirl? I can still picture some of the bottles sitting on my grandmother’s vanity table. If only we could time-travel in order to give our loved ones one more hug and kiss. But since we can’t (at least, I don’t think we can! 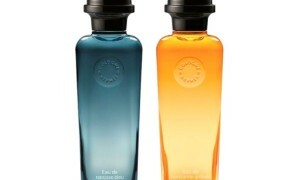 ), the memory of scent and the visual remembrance of the actual bottles will have to do. I’d love to include the photos, but haven’t got a clue how. Small art and love and beauty their drudging spirits knew. Yes, it is bread we fight for — but we fight for roses, too! Victoria: She lived through those times Snyder describes, and she told us how the brigades would come to the village and confiscate all of the harvest, sometimes taking even food from people’s pantries. 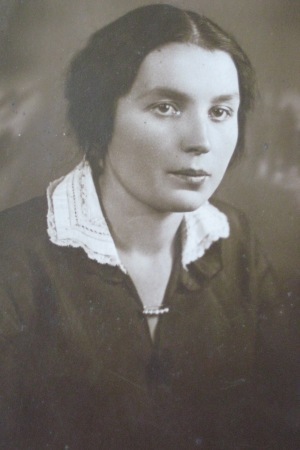 She was a young teacher at the time, and she and her class were sent by the brigades to collect grain that remains on the ground after the harvest and deliver it to the officials. I can’t imagine the hardship she went through, and yet, it’s remarkable how full of joy and high spirits she was when I knew her. She just knew how to enjoy whatever came her way. Cornelia Blimber: People like your great grandparents are the real heroes. to survive such times without hatred and bitterness is a truly great achievement. Victoria: I think so! When I sometimes feel discouraged or stressed over things, I think of what my great-grandparents went through and their attitude. Not to say that our day-to-day pressures aren’t significant (even if the magnitude is different from what the older generation has experienced), but some perspective and hope are always good. Cornelia Blimber: Yes, it is. His biography of Caesar (“Caesar”) is brilliant. The part in which he retells ”De Bello Gallico” is acute and a pleasure to read (of course even better: Caesar himself). But the whole book is marvellous. Another one: ”The Fall of Carthage. The Punic wars 265-146 BC” . This book is rather technical here and there on military matters, not everybody is interested in these details. For me it was a revelation, when I had exams on that matter I did not understand very much about these damned Punic wars. And there is ”The Fall of the West. The Slow Death of the Roman Superpower’.’ Stirring. You can read about the inner weakness of the Roman Empire, the uncertain position of the nervous emperors: so much energy there at the cost of the defending of the frontiers. Another one; “Anthony and Cleopatra”. I think the best to begin with is Caesar- he was such a fascinating person. Another book on Roman history, well written, lovely to read, is ”Rubicon” by Tom Holland. But as far as i can see it,Goldsworthy is the better scholar. Victoria: I personally don’t really care what others think of my interests. Worrying what others think is really too tiring, because there will always be people who disagree, don’t approve, judge, etc. As I mentioned earlier, I really wanted to write this post, because I receive letters and comments about feeling guilty to enjoy perfume, and that’s not right. We shouldn’t care what others think, but we really should create time for pleasures and feel no guilt about it. Phyllis Iervello: I love this wonderful post…it is beautifully written and depicts exactly the way I have felt about perfume ever since I was a young teenage girl. Most of us put our sense of smell on the lower point of importance, way behind our other senses. However, a smell can put you back in time and bring back memories long forgotten. I have collected perfumes from when I was about 17 years old and still do although perhaps not as vicariously as I once did. I will never live long enough to use up all my full bottles. Sarah: Brilliant post! I don’t know why people get so sniffy (sorry) about perfume. Like you say, everyone has their thing, and scent is a very special thing. az: Thank you for sharing the beautiful story of your great-grandmother. I agree with your sentiments – personally I don’t like to be ‘guilted’ to be good or generous. I believe I can give to charity (and whether I do or not is no one else’s business but my own) and indulge myself. annemariec: Well, a stab of guilt every now and again does us no harm, I think. It means we are questioning ourselves and our motives and actions, Discovering where the boundaries are. Guilt is one of the things that make us human. But I do agree, it is pointless to flay ourselves over the enjoyment of small sensual pleasures. Life it too short! I also think that people who criticise us for our enjoyment of perfume, beauty and fashion are essentially criticising our enjoyment of things of the body, rather than of the mind. Scientific American is fine but In Style is somehow – not. That captures what I mean exactly. The message seems to be that cultivating the mind is more important than enjoyment of the body. Victoria: Yes, I completely agree with you. Guilt by itself is not bad, it’s an emotional sign that we’ve done something wrong and it prompts us to re-examine our actions. But guilt in excess becomes an incapacitating emotion. And there are so many ways in which our societies puts women on guilt trips (men too, of course, but most surveys real a huge gender gap when it comes to feeling guilty.) There is always someone out there thinking that their way is the only way of doing things, and which is why they’re ready to moralize on the useless of reading In Style or some such thing. Victoria: I’ll look for Express. Thank you, Andy. I have her How to Eat, and I love just to flip through it and get inspired. Her way of sharing the recipe is always very non-intimidating. Ann: I see this often in the shop. Customers come in and sigh with relief seeing that they are finally in similar company. They thank me for being here. Elena: What a wonderful post, and so many very thoughtful and thought provoking comments! I am glad to have found Sali Hughes today. rose: I also wholeheartedly agree! I. e. in the example in above link jasmine has the same effect as valium, but without the unpleasant side effects. I found that article today. A pot of green tea with real jasmine makes me feel incredibly relaxed. Now I know why! My little terrace is overshadowed by a jasmine tree, though not yet blossoming. On a sunny afternoon I’m going to sit under the jasmine tree with a pot of jasmine tea and smothered in, for example, Songes. Victoria: Exactly! And I have never heard my male friends express guilt over it, in contrast to my girlfriends and their attitudes to their indulgences. MontrealGirl: Victoria, Thank you for addressing an important topic. I’m sure many of us feel a bit guilty about our ‘indulgence’ because it appears frivolous. As you said, we don’t think the same about books, CDs or DVDs yet if anyone ever adds up how much money over the years they’ve spent on books they would be shocked (I did it once when inventorying my library for insurance purposes and was shocked to realize it was the equivalent of a small car!!). Johanob: Hi Victoria!And fellow BdJ lovers and readers! G: Lovely article, Victoria, I enjoyed reading it a lot. Your great-grandmother is so beautiful! Victoria: Thank you so much for sharing this incredible story! I always get emotional thinking about people who leave their countries in search of better life for themselves and their families. And yes, I also feel a pang of guilt at how relatively easy our lives are in comparison to what my grandparents experienced, but then I try to use this emotion to remind me to give back others. Anka: Thank you very much for this great post and all the commentators for their intelligent comments!! Carla: Very good piece. Perfume and tuning into smells has enriched my life so much. I am a practicing (perhaps devout?) Catholic and so I try to stay tuned into my conscience regarding my perfumes. It actually works better than a budget, and my purchases have tapered off a lot in recent years. I have about 25 perfumes that I consider to be parts of my soul, bottled, to paraphrase a comment from the NonBlonde blog. In everything I am trying to keep from becoming too materialistic. Moving from a large cosmopolitan city to a much smaller place has helped stave the materialism a lot. I believe too much of an interest or obsession in material things is not the path to true happiness. Just as Iyengar wrote in Light on Yoga that yoga is freedom from the yoke of want, Jesus said that to have everlasting life we must give up our possessions and follow Him. So I think everyone should be aware of when they cross the line from their perfumes giving them pleasure and helping them appreciate beauty to an obsession with their “collection” in all its details…new releases, notes, categories, brands, trends. Victoria: I think you’re absolutely right, balance is the key. In pretty much anything one does. It’s always a good idea to think through each purchase, which is why I recommend sampling and savoring before splurging on a full sized product. But what’s enough is up to the individual. Carla: I didn’t mean any critique of what you are doing. This is clearly your talent and your calling. I think what I meant was two things. First and foremost, as with all material things, we must be conscious of when we are acquiring and buying just for the sake of acquiring and buying, rather than for a real love of the “juice”. That’s what you were saying anyway. Gentiana: Thank you for the great article! Jordi: Sorry for adding into this older post but I felt your words were important and very true. I have spent a good while reading all the comments and one thing struck me is that most comments are cultured, smart, matured and far from the frivolous or mindless the judgemental people try to label perfume lovers. From my point of view perfume is the art in smell, like music is the art in hearing, paint and drawing the art in seeing and gastronomy a shared art in smelling and tasting. Would anyone close their eyes to a Picasso or their ears to Mozart? True that perfume is new compared to music or painting but so is cinema and I hear it tagged as art quite often. However the key in this and most things in life is respect. We can all have varied tastes and pleasures ( Thank god ) but as long as we respect each others all is debatable and talkable. I for instance being a man love both wine and sports as well as perfumes. I had a few SA in perfume stores shocked about my “knowledge” of perfumes. But I can talk about soccer basketball or any sport, music or visual arts. I embrace art and pleasure because I am a human being capable of understanding the subtleties and talents behind them. Victoria: Thank you for your thoughts, Jordi, and no, it is never too late to add a comment to a discussion. On the contrary, I like it, because it keeps these interesting conversations going and it’s fun to see how our opinions on different perfumes evolve over time. Your comment about cinema also made me think of photography. It started being treated as an artistic form only recently, especially relative to other arts. Ironically, out of all arts, perfumery is the least accessible to non-professionals. You can easily take a painting course or learn how to take interesting photos, but if you wanted to learn perfumery, the options are so few. Yanet: Victoria! Thank you for all the knowledge and passion you share in your amazing blog, and this entry was just so inspiring that I just had to comment even though it is 2 years old! I am sure your great-grandmother is watching over you!. I am a new reader from Cuba. My beloved grandma had a beautiful garden too and there was a rose bush that she planted and dedicated to her late mother. They both went through tough times in the 40s and on in Cuba. She would tell me stories next to the rose bush, and I loved to sniff the flowers. Now the roses are gone and so is my grandmother, I don’t remember what perfume she used, but the scent of gardens and specially rose remind me of her. In the near future I see myself planting a rose bush in my backyard for her..